Contact Points (CPs) are day centres which follow the dictum 'earlier the better'. As the name implies, Contact Points are located at railway stations and crowded places, and act as primary links to identify vulnerable children as soon as they arrive in the city. Contact Points not only work with children 'of the streets' but also with children who are 'on the streets' - living on streets with their families and surviving by begging or ragpicking. Over the years, Community Contact Points have also been established in slum pockets of Delhi such as - Akanksha and Mansarovar park, where there is a large population of children at risk of becoming street children. Life on the streets generally renders children aggressive and emotionally frail, due to lack of care and protection. Contact Point teams fill this void with their warmth and sensitivity. After a medical check-up and medical aid when needed, the team attempts to trace the child's family and understand his/her history. Restoration to the family is always the first choice, but sometimes it is not feasible, or not in the child's best interest, when the child is likely to be abused, exploited or neglected at home. In such cases, the child is encouraged to join a full-care residential centre after being referred to a Child Welfare Committee (CWC). Children living on streets with families and at-risk children are motivated to become regular visitors at Contact Points through a peer education program and the dedicated efforts of Contact Point teams. The team members build a strong rapport with these children by lending them a patient hearing which gives them a feeling that someone cares for them and has the time to listen to their stories. Education and play become major pullers for children to sustain their involvement at Contact Points. Restoring children back to their families. 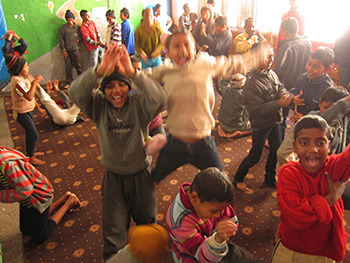 Salaam Baalak Trust runs an outreach programme in slums neighboring its area of operation. Established in 1993, the programme aims at preventing young residents of the area from becoming street children. A major component of the outreach is education, both formal & remedial. Today, over 80 boys and girls between 6 and18 are educated under the programme; school-going children attend formal coaching classes, whereas drop-outs are encouraged to join the NOS system. Children unable to go to school receive non-formal education. Children below 6 are helped to prepare for school through the Play way method. Salaam Baalak Trust also helps empower the women of these areas, thus hoping to improve the overall quality of family life. Some of the interventions in this area include adult education; community development; and health and awareness programmes covering family planning, HIV/AIDS, Personal Hygiene, Child Rights and Women's Rights.